Frugal and Thankful: The generation of entitlement. Some of the representatives of the current generation have an amazing sense of entitlement. You hear the stories about kids suing parents for not providing them with the "lifestyle" they deserve, the offspring who feel that their family should give them all of the "necessities" of the time like cars, fancy clothes and toys of all sorts. And everybody and anybody owes them to please them and let them have what they want. The other day I stumbled upon an interesting discussion on a community group of a famous parenthood website. I wanted to post the link here but the people in charge promptly removed that quite heated conversation. Here's why. The girl who started the topic was asking about GoFundMe. Have you heard of them before? It's a website that gives you an opportunity to set up an account to raise money for personal reasons allowing your family, friends and sometimes total strangers to donate to your cause. I think the idea is actually brilliant. It's a great way to donate to people who are struggling or going through painful life changes like sickness or death. This girl wanted something different. She's a few weeks pregnant with her second child and she wanted to raise money to have her "dream delivery" - naturally in a birthing center. Not a bad goal, right? Well, she continued to explained that it's OK if she doesn't get it but then she would be forced to go to the hospital because its covered by Medicaid. Huh??? That's not all. Somebody responded to her saying that it's a bit tacky to ask for money for our dreams and that instead she needs to create a budget and save the money herself (we are talking about $3600). Her response blew my mind! She said that it would be much easier if they hadn't just spend $3000 on new furniture (seriously, when was the last time you spent 3 grand on new couches??? ), and if she tried to cut back right now she would have to cancel a maternity photo-shoot, new baby photo-shoot, and a Christmas family photo-shoot. Oh, and Christmas for her first child (who will be two by then, mind you). You've got to be kidding me!!! I don't know what bugged me more - the fact that she wants somebody else to pay for her "needs" so she can afford indulgences, or that she's on Medicaid. Really?? She wasn't joking either. Do I think that all of this generation have this entitlement mindset? Of course not. I myself could probably be on the border of the millennials (even though, in my case we are talking about some cultural differences too). But, honestly, it's hard to imagine people feeling so entitled at the beginning of the last century. At least, where I'm from. The next time I decided to go to a location that was in a poorer part of the city because we were in the neighborhood that day. And that's when my eyes were opened... I saw people who were truly struggling. This experience really humbled me. I realized that despite unemployment we weren't in need. In fact, we had plenty for our needs and to share with others. That night I actually went home and collected a bag for the food bank. Do you feel that this generation is a generation of entitlement, or are those just rare individuals, in your opinion? And what are your best ideas on how to help our children to grow up being more caring and less demanding? I dont read such things just because it makes me so cross. I like to stay with my illusion that everyone is nice and hard working (ssshhh, its true)! I, too. have seen what you are talking about- the sense of entitlement that so many seem to have these days. It disgusts me too. I am not talking about the people who genuinely need help and live humbly and within their means- I applaud communities who pitch in and help those around them and I feel that if a person is working to do their best to provide and they need help I think it is wonderful that there is help out there to be had. I also feel that if a person works hard and earns a lot of money and likes their gadgets and a lavish lifestyle, I believe they earn that and that is fine too. I am talking about the others- I have seen people who are getting public assistance while walking around with smartphones that cost hundreds of dollars. It makes me sad to see and hear the younger generation's mindset of today. I try really hard to instill values and work ethic in my kids so they know what it is like to earn things they want and need- not just expect them. I recently called the principal at my son's school about the fundraiser that they have every year. I have never called the school to complain or anything ever before- I have a really good relationship with the staff there, but this was really bothering me. They have a fundraiser each year where the parents donate stamps to the school and then the school sends letters out to hundreds of friends and family members asking them for monetary donations for this fundraiser. The kids, in turn, walk around the track a couple of times. I couldn't believe that this is now a regular thing in the schools. When I was a kid we walked around the neighborhood and sold things- people received items in return for their money and kids earned prizes and the school earned the profits. Whatever happened to those fundraisers? Anyway, I had a nice friendly discussion with the principal about how this whole method of 'fundraising' goes against everything we are trying to teach our kids about earning things in life. I feel it is basically telling them that when they need money they just put their hand out and ask family and friends for it. I also was not at all comfortable with the idea of soliciting our family and friends for money- it was kind of appalling to me. She agreed with me and gave me some rehearsed lines that amounted to "this is an easier way to raise money and all the school are doing it." I was not really happy about it when we ended the call but I am not going to fight the school over it. I feel like the sense of entitlement that kids today have is a direct result of the things they see and hear around them. It is hard at times as a parent to try to raise your children with decent morals and values that go against the selfishness and greed and laziness All we can do is do our best and pray our children know better. Wow, that's a new kind of fundraiser for me! Our kids are still selling things.... You know what, I'm taking it back! We were asked to donate money to get tablets for the kids. It actually bugged me a lot because in this world of technology kids are forgetting what the real books are. So in our school they are getting into this new "give me" mindset too, unfortunately. I sold things as did my kids in school to raise money, and quite frankly most of the stuff we sold was junk. I would rather give money than buy something I don't need. However, when kids are a little older, there are lots of ways to earn money that include real work like doing chores and donating money to a cause. The responses of the pregnant girl above were so outrageous, that I think she was just saying provocative statements to get attention. As we know, people say all kinds of things behind the protection of the internet. If it were for real, I am very upset also. You are right, there are many in this 'new' generation who feel entitled. I think it's my generation who is to blame. While we were trying to give our kids everything we didn't get, we spoiled them. Now I'm using the proverbial 'we', but I'm fortunate because my kids work very hard, and never ask for anything. They understand that they can't have anything unless they 'earn' it. (i.e. working). If they don't work, they don't get. I'm grateful I didn't destroy them that way. But, then again, I was raised with morals and standards. Some of these kids had absolutely no direction. Be very careful with sites who 'plea' they are in a bad way. Some are true scams. Interestingly enough, I was fortunate to get an early copy of Dave Ramsey & Rachel Cruz's new book, Smart Money, Smart Kids. It is a 'bible' on how to raise financially responsible kids. This generation of young adults need to educate themselves, so they may educate their kids. You, my dear, are doing GREAT. Your kids will be just fine. :)! Don't even get me started... I SEE this mentality every day; in my employees at FT job, and with my coworkers at PT job. The worst part is that they justify it and in their eyes, as twisted as it is, it is RIGHT to play these games to get more, more, more than they need, at the expense of others, just because they CAN. Here I am being a miser over buying $20 work shoes that will hopefully last me a year or two on my 2nd job, and they are financing the newest iphone while collecting every single type of welfare under the sun because it is just free money to them. Yeah, no. I'm in that generation, but truly, I feel I should've been born in the 60's or 70's. I don't have any kids, so I wouldn't know how to teach them... but back home, we always had to make donations (money, books, school supplies), and you as a kid had to make the determination of what went, and they made it into a contest, which made us raise more than we could've otherwise. Once you start putting others' more dire needs in front of your smaller needs, it makes a huge difference. Maybe take the kids shopping with a limited budget where they can buy something for themselves, and either donate or buy things to donate to someone in specific that is less fortunate. May feel a bit like guilting them into donating more when they see that spending $1 in a poor person is not enough compared to their $9 toy, but it isn't a nice reality regardless how nicely we can try to paint it. Every time my kids complain about how strict I was when they were young, I refer them to their cousin and how he was raised and how his name now is Mr. Entitled. He believes the world OWES him everything and he will not lift a finger to improve his own lot in life, though he is living on the edge and if, no...WHEN his father dies he will be out on the street(or living with whoever he cons next into housing him). He has yet to hold a job, any job and he'll be 20 next month. He is not handicapped or disabled(except in his outlook on life)he is just lazy and doesn't see the need that he should work for ANYTHING in life. When he was younger my hubs and I tried, as his aunt/uncle to instill some kind of work ethic in him but his father undid any good we ever did in that regard. Now, he is beyond our "help" and we refuse to give him handouts of any kind. Some people just need to hit bottom to get that fire to light in their souls. Dear Lena, It is unbelievable what people do nowadays. I cringe when I hear about people asking for donations for vacations (ahem... my sister-in-law and her sons), to pay off their debt, or any of the other ridiculous things they want others to fund for them. Do they think we are that stupid? It's ironic that you posted this yesterday because I got a GoFundMe email from one of my friend's daughters. She is 16 years old and is trying to raise money to help build housing in a poor area of Mexico. I am all for this type of giving, in fact I think more of this type of giving should happen, but when it comes to the example you give of the expectant mother…I just don't get it. Some people have no shame. They should be sent to India, the Phillipines, or some other place to show them abject poverty - it might teach them a lesson…MAYBE! I don't even know what to tell you about your experience going to a food bank. There were actually people there with iPhones and talking about buying tablets with their next paychecks? These are the types I do NOT want to help. You, on the other hand, should not have felt embarrassed being there. You had a real reason. Great comments to your post! Yes, I have seen what you describe over and over and I think it's getting worse:( How to keep our children from feeling and acting entitled? 1) Don't give them everything they want; make them earn what they want so they will appreciate it. 2) Teach them how to give and serve others. One of the biggest mistakes we make as parents is to let our kids grow up thinking it really is all about them! As much as we love them, it isn't all about them and never will be. 3) Let them see that there are other children that have so much less than they have by having them give to the poor or visit hospitals with sick children to cheer them up! From what I read on your blog, you teach your children well. Bless you for that! Ha ha! How timely. Here's my story. Lovely young man that I admire but he's twenty-six and has just finished his master's degree. Three years ago he was OUTRAGED that his younger brother moved out of the family home to live on his own with roommates instead of at home, where his dad took care of all. Now this young man has NEVER had a job, not even a part time position. He just finished his master's degree and his dad even went so far as to tell him that it was high time he started earning to pay his way. He still lives at home, has no job yet but has a teaching degree, just engaged to a girl in another state and started a GoFundMe to move her here after their wedding in June. I LIKE this young guy. He has many old fashioned qualities but he has some 'new' fashioned ones, too... Now I confess I was wondering if we'd do something for him once he was married, but when I told my husband about his GoFundMe, he explained to me very nicely that we wouldn't be gifting him anything and most definitely NOT support his idea that it was other's responsibility to move his bride here. And I can't even say I think he's wrong, because if it were one of MY kids I'd be aghast they'd even think such a thing! In fact it wasn't so long ago that my dil did do something like this and I was pretty well ticked. And no we didn't give a donation to that cause either. It's a very sad mentality. I love to help others, and I will continue to do so, but definitely I struggle with "I am saving money so I can help others", and the fact that most time the others have much nicer and newer things that we do. That pregnant woman not only had a sense of entitlement, but she was just stupid enough to keep talking. People who give do try to discern who really needs their help. Those people probably did not feel sorry she would not be able to make all her photo appointments if they did not give her money. I do go to food banks, but I do not have all the fancy things some of these people have. Some are in abject poverty, teeth are rotting out of their mouths, and their hair is filthy. But, they do have the latest expensive phone. Most of their cars are better than my 14-yr-old car. AND, they discuss these things in hearing of everyone. One food bank has a sign: "If you can afford to smoke, you don't need help with food." My children expect nothing from others. They all three work hard. My one daughter does need help, but the other two are teachers. Thankfully, all three are on the right track financially. When they were young, the NEVER got a toy in the grocery store and never got toys except at Christmas and birthdays. Well, one time I bought them pinwheels on a windy day in 1973 or 1974, the day we had a horrific tornado outbreak in the US. One Christmas, I decided I had bought too much and put away two of the huge Tonka toys. I gave them to them in June because they were really outdoor toys. They were ecstatic, asking why they got a toy "What holiday, it's not a birthday"--not an entitled bone in those little bodies. 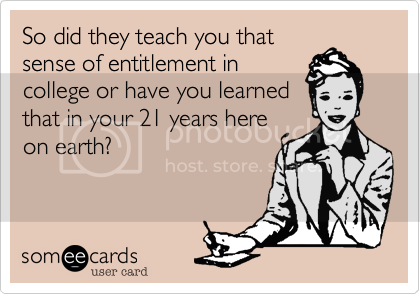 Unfortunately I don't think it is just the millennials that have the sense of entitlement. I see it in boomers and generation x too. I don't remember seeing it in my parents or grandparents generations; they seemed to have a different mindset. There are hardworking people in every generation, and I hope to instill good work ethics in my children. I think it's definitely a prevailing mindset, and not just with kids. A lot of things are changing, some for the good, some not so much. I think the sense of entitlement so many think they should be afforded is going to backfire bigtime for all of us, if it's not curtailed. Just my 2-cents. Reminds me of a placement student at my job last year. She was whining and griping about how her home phone was shut off because she hadn't paid the bill. In the next sentence, she proudly told us she was getting a $1000 tattoo that very week. WOW!!!!! So you won't pay your bills, but you will spend $1000 on a tattoo??????? To quote a line from Ferris Buellers Day Off....."I weep for the future!" Lena, I just stumbled on your blog as I was searching for information on sense of entitlement. Your blog touched me. I will admit that at the beginning I was finding it a bit boring (another-complaining-about-someone-else-without-doing-anything-about-it type of thoughts). Then you wrote about your own experience and your decision to share with the food bank. We need to push this type of attitude forward more. Thank you very much for a great discussion!